Hello all, I have an update for Nikon D750 users. We have successuflly tweaked the previuos "special D750 hot shoe" so that it will now work reliably on Nikon D750 for TTL Pass Through yet still compatible on other cameras with standard ISO hot shoes. There is no longer a D750 version of the metal hot shoe (the actual plate) - there is now only one version and we are using it in our standard productions. The older metal shoes have been phased out. A new customer wishing to purchase a V6 for a D750 still need to alert us when you check out at the Cactus Store and we will then specially test and make sure the V6 unit works with TTL pass through on the D750. An existing V6 user who recently switched to a D750 and your V6 units were purchased before December 2015, you likely have the original hot shoe and you may need to swap to the new shoe. Don't worry, you may send it back and we can replace the new production version hot shoe plate for you. Lastly, a general tip for using TTL Pass Through - if your portable flash model is listed on the flash profile list, choose the corresponding profile on the V6 and enable TTL pass through by pressing and holding the MENU button for 3 seconds. Thank you for your time reading. If you have any questions please let us know. wiggling it in an attempt to get the pins off contact. Antonio, may I suggest that you add a note to the V6 listing at your store regarding the recommendation to explicitly state at checkout whenever the V6 is intended for a D750? Ideally, the same recommendation should be made during the checkout process whenever the cart contains a V6. Good call! Thank you, Class A. That's good news! Mine are on their way. @yungyaw they just arrived! I will get them sorted for you ASAP! @Antonio, great news! Thanks a lot for your help! I purchased five of the Cactus V6 transceivers on Amazon (sold by Adorama) on May 7, 2016. If I sent you the serial numbers of these transceivers, would you be able to identify whether these are the new or old models? We can only identify if they belong to production batch that dates before November 2015. But judging that you recently bought yours from Adorama, I believe your V6 units already have the new shoe. FYi even if it has the newer version hot shoe, there is still a chance that the D750 may still not work consistently. So if you send yours back we run them thorugh a rigorous test in the studio and pick out the best ones. Have you already been using all five of your V6 on the D750? 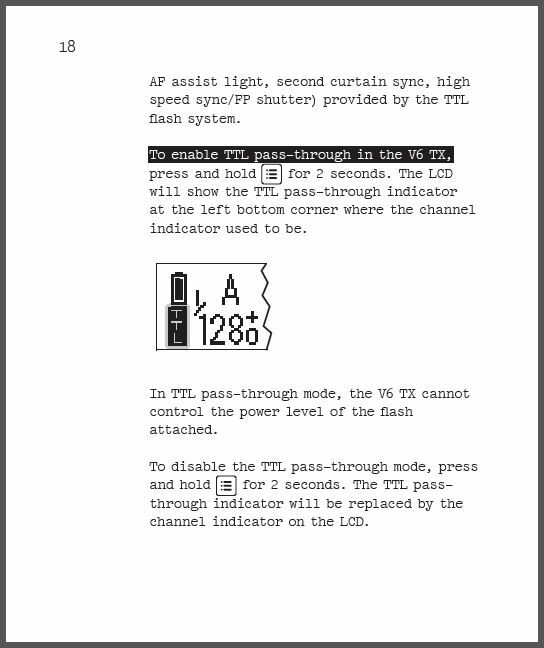 Are you experiencing any connection problems between your Nikon flash mounted on V6 (TX mode) on your camera as on-camera fill flash with TTL Pass Through enabled on the V6? Thank you and let us know how we may assist further. I'm currently not home where my triggers are. I will test them for TTL pass through when I return Friday and I will report back. I wasn't aware that I needed to "enable" it by pressing and holding the menu button for a few seconds when I tried it last. Sure do give it a try when you are home.